On April 28, Sunday, at 2 pm, at Dr. Sun Yat-Sen Classical Chinese Garden Chinese Garden in Vancouver, Linda Lau Anusasananan, author of The Hakka Cookbook, Chinese Soul Food from around the World, will share her book that traces the diverse cuisine of the Chinese nomads known as the Hakka. This former Sunset Magazine food writer will discuss her journey to discover her Hakka identity through food. Beginning in her grandmother’s kitchen in California, Anusasananan travels to her family’s home in China, and from there fans out to embrace Hakka cooking across the globe—including Hong Kong, Taiwan, Singapore, Malaysia, Canada, Peru, and beyond. This book likens Hakka cooking to a nomadic type of “soul food,” or a hearty cooking tradition that responds to a shared history of hardship and oppression. Earthy, honest, and robust, it reflects the diversity of the estimated 75 million Hakka living in China and greater Asia, and in scattered communities around the world—yet still retains a core flavor and technique. 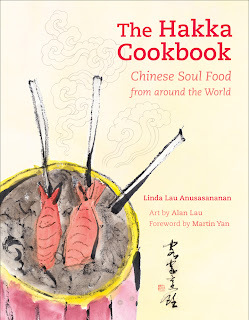 The book was awarded "Best Chinese Cuisine Cookbook or the World 2012" by Gourmand World Cookbook Awards. It was also included in "best cookbooks of 2012" lists for Martha Stewart Living, Saveur, Associated Press, and Toronto Globe and Mail.